Our Brazilian brothers, Gizmodo.com.br, got their hot little hands on a few photos of a new iPhone, to be announced next week. How? Well, there's a Foxconn factory in Brazil, and Pedro & co got one of their men inside. 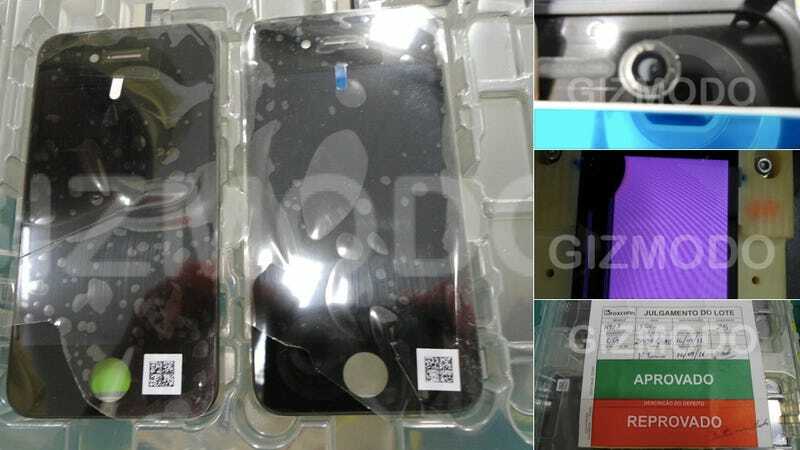 Inside, they found a new-SKU iPhone that looks just like the old iPhone 4. Most of these photos don't look like anything special—just snapshots of a familiar face. But when you get to the last one, a picture of a Foxconn Brazil quality control form, you'll notice something strange: a different model number, N90A. This has already been rumored to represent a cheaper version of the iPhone4. These particular phones won't be hitting any shelves anytime soon though—they didn't meet Apple's manufacturing standards. Gizmodo Brazil editor-in-chief Pedro Burgos tells us that, though the note scribbled in the "reprovado" ("disqualified") section is hard to read, he's pretty sure it says "lenses sent stained." Now what the hell does that mean? Who knows. It might have something to do with the camera lens, or maybe that's an aberration on the screen shown in photo 4. Still, this is good news for those of you wishing for a more affordable iPhone. For the rest of us eager to get our hands on a next-gen iPhone with some tricked out hardware, we'll just have to wait till Tuesday, when Apple will hopefully announce its new hotness.